The question of who we save, and why we save them haunts In-The-Moment Theatre’s The Lavender Railroad, playing at The Box Theatre. Despite its heavy-handed title, this is not a show that takes its subject matter lightly, but instead tries to understand how a dark-mirror world could or would inform the traditional values people hold dear. In a world very much like our own, homosexuality is punishable by death. Individuals who are caught in the act flee along the Lavender Railroad to safe houses (we are never informed if there is an end point to their lives as fugitives beyond these houses). The play is divided into two acts. Act One follows the fugitive, Sebastien (Tony Babcock), who has been caught while fleeing by the mysterious Mother Courage (Peter Nelson). Their antagonistic conversation becomes a game of cat and mouse as Courage tries to figure out if it’s worth the sacrifice to the railroad to save one man, and Sebastien argues the immediacy of his circumstance demands salvation. 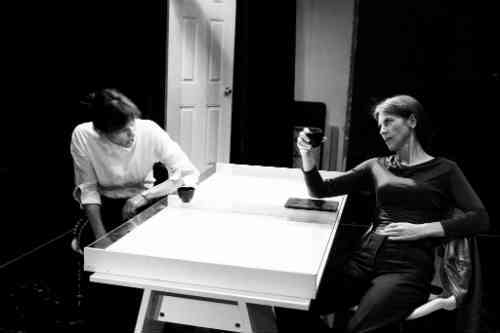 In act two, a Sister’s (Judith Cockman) presence is requested by a Commander (Jennifer Vallance), a familiar face from her past. The Commander is looking for information on the railroad, claiming she wants to escape the system she helps maintain. The Sister isn’t sure if her old lover can be trusted. Both my guest and I were blown away by the second act. Cockman and Vallance are vibrant actors, and their chemistry was incredible. Every word they spoke was imbued with double-speak so that by the end, you didn’t know what exactly you were meant to believe. The dialogue is a thing of beauty. Even when the plot gets somewhat ridiculous, heading into soap opera territory, it’s the actors and the writing that keep it grounded. There’s this moment, for example, after the big reveal, that the Sister and the Commander sit across from each other, spent from their argument and the alcohol they’ve been drinking. Everything has been laid out on the table and suddenly, they’re relaxed, picking through what remains, potentially as allies but also potentially as foes. The moment is warm but has an uncomfortable sense of a power grab. We don’t know who is winning in their conversation and the stakes are shockingly high. In fact, I’d argue act two is the better play. Sebastien and Mother Courage lay a few tidbits of world-building information, but it’s nothing that isn’t covered later. Presented in ridiculous lavender-hued light, the opening is a lot of exposition—not terribly done, just politely bland. Nelson’s Mother Courage is villainously enigmatic and Babcock’s Sebastien is suitably appalled he might die, but their back and forth is little more than a formality. There’s no reason to invest in their relationship. The real meat is The Sister and The Commander, two opposing forces whose personal connection fleshes out the world. Better yet, it’s a larger battle twisted into a single moment. Who wins in their exchange is so important to the larger point of the play. And it’s too bad that The Box Theatre is both a perfect venue and a hard venue for such a work. My guest thought the idea to have a smaller space with a smaller audience really benefited the content, but man was it hot. I don’t know how I might have felt if the show went on longer or the audience was bigger. The size of the space, however, let the actors spend their time acting instead of trying to project each and every tiny detail. The Lavender Railroad is not going to change the world. Instead, it delivers a tense little play, with great actors and a punch to the gut you may or may not see coming. Thank you for the review, we are adding extra AC tonight!